Once a year, local comedians say "thank you" to the community by hosting a free afternoon of comedy in Golden Gate Park. The 2019 Comedy Day in San Francisco is on Sunday, September 15 from 12pm to 5pm. The event features more than 40 comedians from the San Francisco Bay Area and beyond. All comedians are asked to keep it clean during their acts, but sometimes they slip, so we would consider this a PG-13 show. All performances take place in Sharon Meadow in Golden Gate Park. This annual event draws a large crowd and there is always limited seating, so I recommend showing up early to grab your seat for the show. It will begin with a brief opening act around 11:45am and last until around 5pm. Click here for a list of comedians scheduled to perform this year. Comedy Day in San Francisco continues to feature even more food and beverage vendors each year. Here are some of the vendors that you can look forward to each year. There are only a handful of places to stay near Golden Gate Park, so I always recommend staying in Union Square for these types of events. This is where you will find the best hotel options and it's an easy light rail train or bus ride away. You can also find some options in a few districts that are a little closer including Alamo Square, the Haight Ashbury, and Civic Center/Hayes Valley. Click the links below for my recommendations in each of these districts. You can also look for hotels on TripAdvisor.com. I love to check out their current special offers before booking. Their deals range from a discount on your nightly room rate to free parking or breakfast. Click here to check out their deals in San Francisco. Robin Williams Meadow is on the southeastern corner of Golden Gate Park. You will find it near the western side of the Haight Ashbury District near Kezar Stadium. You will find a number of transportation options to get to Robin Williams Meadow. Muni Buses: You can take a variety of buses from all over San Francisco to get to the 2016 Comedy Day in San Francisco. These all drop within a few blocks of the event: 5, 6, 21, 33, 37, 43, 44, & 71. Light Rail Train: Take the N-Judah Light Rail Train to the stop at Stanyan and Carl Streets. From here, walk north on Stanyan until you see Golden Gate Park. 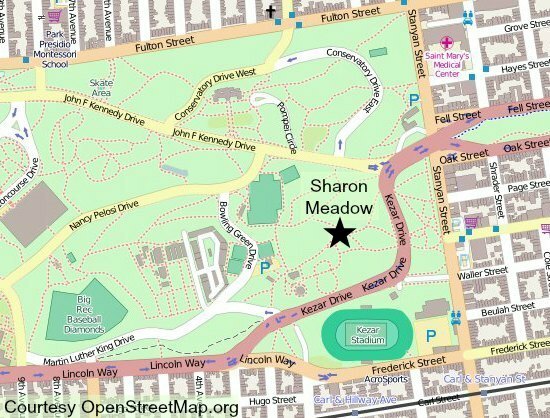 You will then enter the park and find Sharon Meadow behind Kezar Stadium. Driving & Parking: As I mentioned above, this event is really popular and draws a large crowd. I don't recommend driving unless it's your only option. The best place to look for parking is outside the park in the Cole Valley or Inner Sunset districts. Both are on the southern side of the park. You might be able to find parking along Frederick Street or just to the south of it. Most of the time, you will need to park several blocks away, so plan to walk quite a while from your parking spot to Sharon Meadow. It's mostly two-hour parking in and around Golden Gate Park, so make sure you check out the parking signs near your car before you leave it. They do ticket frequently in this area. You can also check out the parking garage in between the California Academy of Sciences and the de Young Museum. It's a great option if you do not want to walk too far. However, it is very expensive to park there all day ($5 an hour, $28 maximum for the day) and fills up early in the morning on the weekends. SF Giants: Check the SF Giants schedule. You can still catch a game or two this season at Oracle Park (formerly AT&T Park) in the SOMA district. Click here for more details. SF Theater: Catch a Broadway performance or a fun show at a small, local theater during your stay. On my theater calendar, you will find all of the top shows as well as the smaller ones. Click here for additional details. San Francisco Fringe Festival: If you love the theater, you will also love this grassroots theater festival every fall in SF. They feature dozens of performances from local groups. Click here for details. Savings Tip: Another place to check for top events this weekend is on Goldstar. They offer tickets for dozens of events at up to 50% off the full retail value. It's a great place to look for tours as well as tickets to upcoming events. Click here to head to Goldstar and check out their current selection of affordable tickets.